When it comes to content marketing, everybody tries to check off all the boxes, without really understanding why they’re doing the content at all. Companies say, “We haven’t done an eBook yet, we should do one of those.” Or “I don’t think we have a podcast yet; let’s do that.” We content marketers tend to think of ourselves as publishers, without keeping in mind one significant difference: The end goal is action, not eyeballs. You have to deliver more than just content and noise to achieve those goals. Using the right metrics can help you determine if you are delivering the right content to the right people at the right time. There are dozens of metrics out there. But I want to focus on the four types—consumption, lead generation, sharing and sales—that will help you understand just how your content impacts your business. Let’s look at each of these categories, as well as how to calculate content-marketing return on investment (ROI) to help you achieve your business goals. 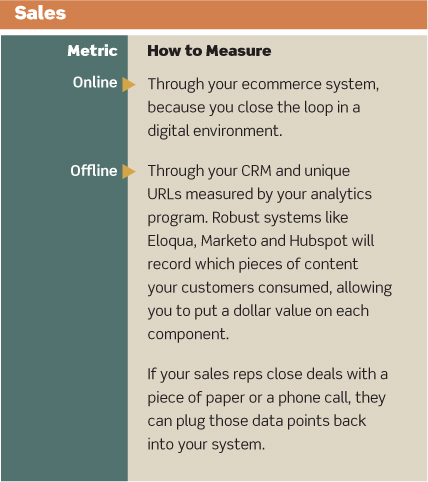 If you’re just starting to set foot in content-marketing measurements, consumption metrics are typically the easiest to set up and understand. In addition to affecting other metric categories, consumption metrics help you measure brand awareness and website traffic. Do people consuming this content engage in other, more desirable behaviors on my site? Do people consuming this content come back for more? If you don’t know that these people are doing other more desirable things on your web site, and at a different rate than overall, then you are lying to yourself about the effectiveness of your content. Of all the places your content could reside, your site may have the least amount of traffic. Fortunately, the web has bred a culture of sharing, and this is totally measurable (if you look at the right metrics). 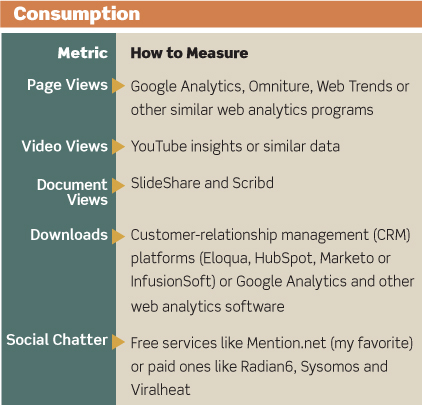 What organizational goals do we measure with sharing metrics? We look at brand awareness, because shares via Twitter, Facebook, LinkedIn, etc., create that ripple-in-a-pond impact so new people will see your content. We also address the goal of engagement. 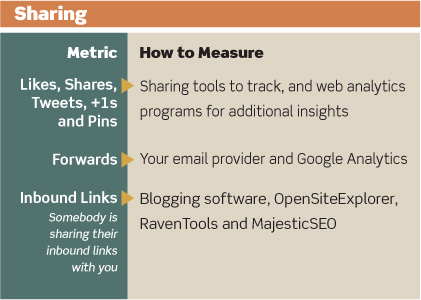 Measuring sharing metrics is important for every organization. People who hate you almost never retweet you. And if somebody cares enough about the content to share it, chances are higher they will then do whatever you want them to do next, whether it is fill out the lead form, buy, etc. 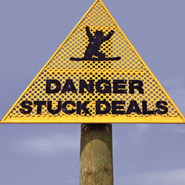 Sharing behaviors are often a marker for eventual lead generation and sales behaviors. You should keep one thing in mind, however: Sharing metrics are often overvalued because they’re measured publicly, in full view of prospects and competitors. Do you know why we care so much about the number of Facebook likes or retweets? Because all you have to do is go to the page, and there’s the little odometer number. It’s a very public contest. Assign an internal business value to sharing metrics, or you may get caught up in a competition that has no real impact on your bottom line. Place easy-to-use sharing buttons on every piece of content. Configure them to focus on the channels your audience uses most. Make sure any infographics you create are easy to embed. Embed positive Twitter comments on your website. That kind of social proof can encourage more sharing to happen. Most importantly, ensure that you create content that’s worth sharing. Data shows that there’s been a sharp increase in the amount of content created. I will tell you, though, that we are sacrificing quality for volume. At my company, we recently moved from six blog posts a week to three. Talk about a counterintuitive decision. We knew the six weren’t as good as they used to be because we fell into the trap of more, not better. Don’t do that. This can’t be overstated: If your mom wouldn’t share your content, it’s not good enough. And if it’s not good enough to be shared, don’t publish it. Lead generation is often an emphatic goal for content creation, especially in B2B. You should also examine your conversion rate, how often visitors who consume content become leads. Conversion rate is key to viewing lead generation from the highest level. It comes in handy if you’re comparing your overall website conversion rate to that of an individual piece of content. For instance, if your overall conversion rate is 2 percent, the eBook that’s converting at 1 percent isn’t working as well as you might think. You need to know what your average conversion rate is, or you’re tossing that number around in a vacuum. People ask me all the time: What’s a good conversion rate or what’s your industry average? You’re not your industry, you’re your company. Play your own game mathematically. 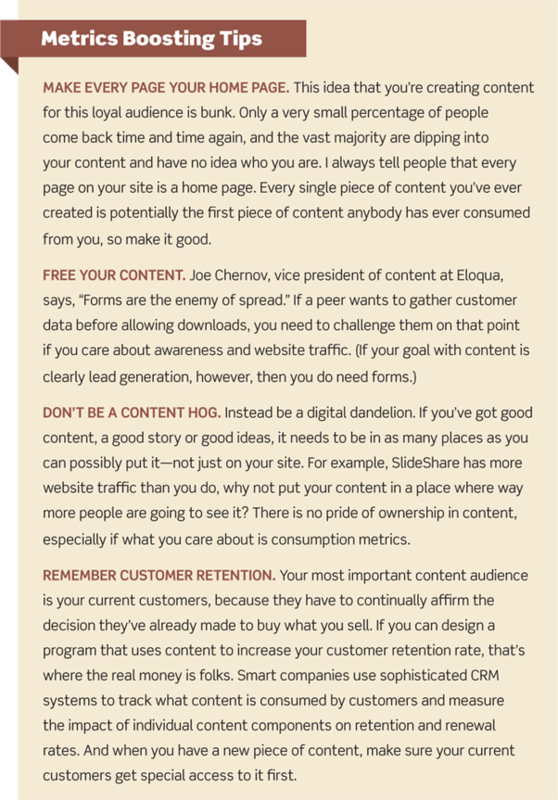 You also have to realize that not all of your content produces leads directly. However, all of your content can contribute to lead-generation behavior. Therefore, set goals in Google Analytics (or a similar data program) to measure how content contributes indirectly to lead generation. For key behaviors that don’t produce revenue immediately (like email sign-up), assign a specific dollar value. For example, new email subscribers = $5, podcast sign-ups = $10 and eBook downloads = $25. Set custom reports to show goals for each piece of content. Look at the new “page-value” data in Google Analytics, which assigns value to each page corresponding to how often it is viewed on the way to a conversion. Ah yes, sales. 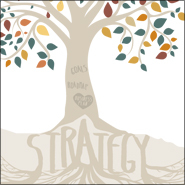 The ultimate goal of your content marketing is (and always has been) to grow the business. Here, you’ll find out how your content impacts customer acquisition and sales goals. Remember, if you’re going to track leads and sales, you have to do something trackable. To understand the impact of a Facebook status update for instance, you should include a call to action that is unique to that piece of content. I used to be on a theatre company board, and if we had extra tickets, we’d put a two-for-one password on Facebook and Twitter. We tracked who used the password with a post-it and a golf pencil. So it’s not about the software, it’s about doing something trackable. 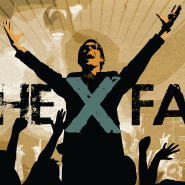 Multiply that result by the overhead factor. This accounts for rent, insurance, utilities, etc., and is often 50%. Thus, a $20/hour employee is really a $30/hour employee when overhead is factored into the equation. Step 2: Calculate the return. Multiply your leads per month by your lead conversion rate (LCR), average lifetime customer value and average profit margin. ROI is a formula just like temperature is a formula, and you can’t put a spin on it. The 25% in this example is the exact ROI of that blog, and you should run that same calculation on every piece of content that you do. Track everything over a long period of time. Take note whenever anything changes, including PR coverage, website updates or new radio campaigns, for example. Track multiple revenue data points, including total leads, new customers, average order size, churn and total revenue. Look for patterns that indicate your content is working (e.g., when revenue went up, content consumption and sharing metrics also went up). The correlation approach isn’t an exact science. But it gets content marketers further than doing nothing at all, making it an important and viable alternative. Remember that for every blog post, podcast, infographic or photo, if your mom—who pretty much gives you the benefit of the doubt and loves you unconditionally—won’t share your content, it’s just not good enough. Beyond that, content is the means, not the end. 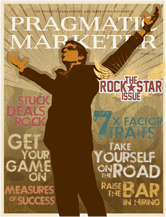 You should frame your motivation for content marketing with that in mind. Our goal as content marketers isn’t to be good at content; it’s to be good at business because of content. So measure your content to make sure it achieves your business goals.